Workers are sewing and designing camouflage in a workshop. Behind them, large samples are hung from the walls. 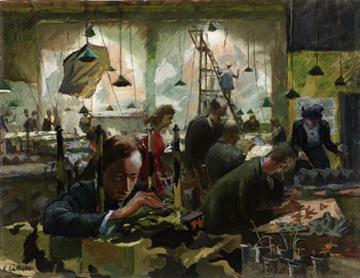 The enclosed room with bright electric lighting and the level of industry imply that the work was both secretive and urgent: camouflage was an essential defence, particularly for buildings during daylight air raids. Many artists with their awareness of perception and pattern were involved in its design and production.